Softest shirt of all time - So comfortable and so cute! This thermal top is perfect for those winter rodeos! Sizes run a little on the smaller size. Outlaw Cowgirls Wanted! Retro photo and soft material make this shirt a must have! Junior sizing, so it runs a bit small. Classic meets trendy! This top is a personal favorite! Soft, comfy, and cute as could be! 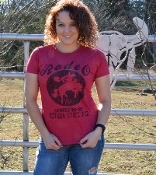 This tshirt is perfct for showing off your rodeo side!